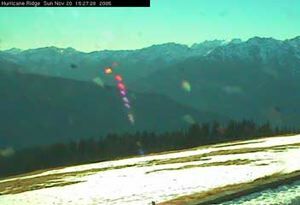 Last winter, we didn't get up to Hurricane Ridge very much. Either it was snowing, or it had stopped snowing, but the plow was broken, or all the snow had melted. This year, things we hope for better, and the season is already showing some promise. Today, the road was open, there was a nice coating of snow, and everyone seemed to be heading up to the Ridge to work off some Thanksgiving turkey. 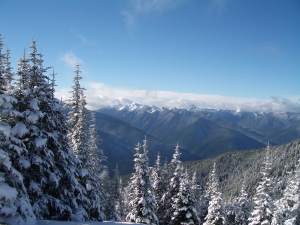 We put on our snowshoes and hiked from the Hurricane Ridge lodge to the Hurricane Hill trailhead. We ran into others on snowshoes, cross country skiers, and a number of people just tromping along in boots. The sky was bright blue, with just a hint of cloud, and the air was wonderfully clear. This latter was an especial relief since we had been enduring a bit of fog and bad air of late. The ski lift wasn't open yet, but there were lots of people with sleds, snowboards and even skis. Of course, they had to climb Sunrise Peak by foot without the lift. As for us, we came for the exercise. You may remember our quandary last year with regard to a surfeit of oysters closely followed by a surfeit of poultry. Well, it's that time of year again. We now officially have a surfeit of turkeys. We innocently ordered one, make a note of that, one, large heritage breed turkey from Heritage Food USA. 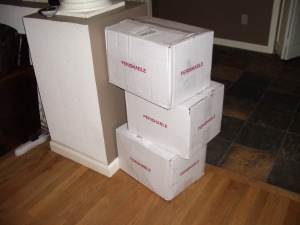 We were eagerly waiting in our doorway when the Federal Express truck arrived. We accepted our turkey in its white shipping carton and thanked the delivery man for getting us our bird. We were all set to sign off, but he told us that he wasn't done yet. We had three boxes. Indeed, we had three turkeys, each in its own white shipping carton. There was a 21 pounder and two 18 pounders. That's 57 pounds of turkey for two people. Even we have to draw the line somewhere. We officially declared a surfeit, and scrambled madly for freezer space. One bird is for Thanksgiving, but, as you might expect, we have plans for the other two. 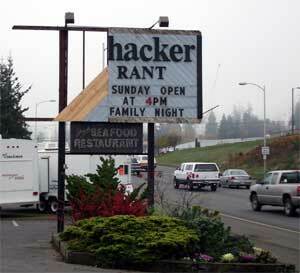 We had a bit of wind last week in Port Angeles, and the sign at the Bushwhacker Restaurant on First Street was damaged. 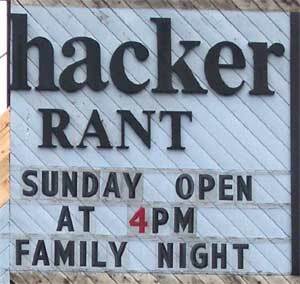 The Bushwhacker, a seafood restaurant, seems to be going after a new crowd, the family hackers. We have to check it out. Come one, come all, and bring your favorite LINUX device driver module and DRM hacking tools! Be prepared to flame. The above mural is in the lobby of the General Administration Building in Olympia, Washington. It represents the great economic output of the state. You can see Paul Bunyan standing in for forestry, the air control tower for Boeing and aerospace, an apple tree and a ladder for the orchards, cattle, deer, streamlined trains, and unfortunately, a symbol representing the pre-quantum theory model of the atom, presumably representing the atomic facilities at Hanford. These murals are wonderful, but they are a thing of the past. What would the modern version of this mural contain? A cup of coffee for Starbucks, books, and perhaps delivery trucks, for Borders and Amazon. What about Microsoft? Perhaps it could show a personal computer or a security patch download. Medical research at the Hutch and elsewhere should be easy. It could still have a test tube and stethoscope, but the doctor might be a woman. Who knows what real research gear looks like today? Probably it looks like a bunch of computers, sans 1960s tape drives, with tubes coming out of it. How does one portray insurance? What is the instantly recognizable symbol for a web farm? There is still ship work, and aerospace, and timber. There are still farms out there, and deer and birds. Unfortunately, there do not seem to be any artists producing more modern versions of this type of mural. In the 1930s, Fortune magazine was full of this type of art, representing resources and industry. Nowadays, fewer people think this kind of thing is interesting. This is sad because it is still important to think about where things come from, and not leaving such knowledge to a handful of presumed experts. With the late autumn moisture in the air, there is lots of soft light and lots of soft clouds. This photo was taken from near the Devil's Punchbowl, a popular swimming place along the Spruce Railroad Trail. It's a view west across the lake. 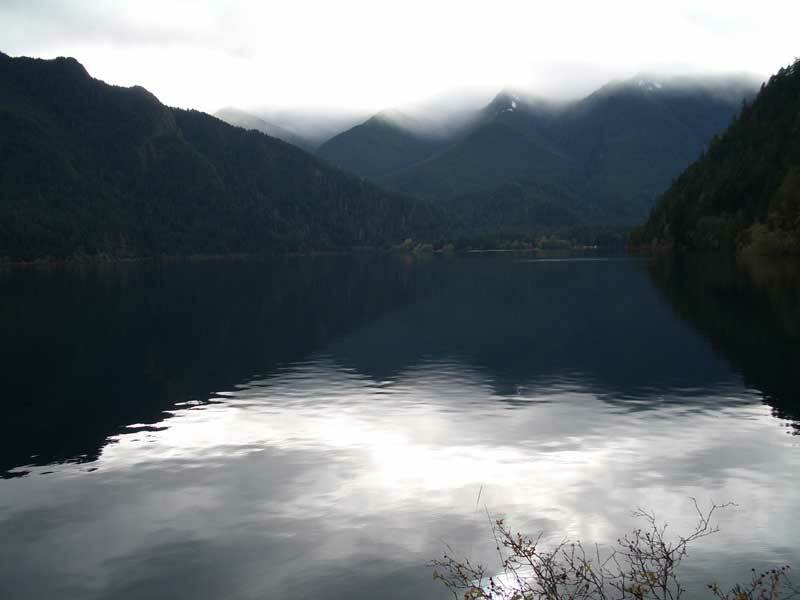 Click on the image for a larger version, and enjoy the soft clouds, the soft sky and the soft lake water. This is one of those dishes that one reads about, but that one never sees served in restaurants. Most Alaska king crab is frozen when it is caught, or as soon as the ship arrives in port. The only people who get fresh king crab legs are people who catch them for themselves. One of the advantages of living in Washington State is that Alaska is sort of the next state to the north, if you don't count British Columbia and the like. This means that the folks at Bella Italia were able to snarf a some fresh Alaskan king crab legs from their friends to the north. We were trying to figure out what to do for dinner when we got the call. Dave Senters was cooking, the crab was in, and we were ready. The dish pictured above is a plate of fresh Alaskan king crab meat with fried bread crumbs, fried garlic, baby potatoes, and fresh scallions in brown butter sauce with balsamic vinegar on angel hair pasta. We were quite impressed. The crab meat was richer in flavor than our own local Dungeness crab meat, and had a meaty, almost chunky texture. It was as sweet as local crab, but the chunks were larger. If you've ever had Alaskan kind crab legs at an upmarket brunch, you probably remember them as a bit bland and watery, perhaps even a bit stringy. There was none of this here. 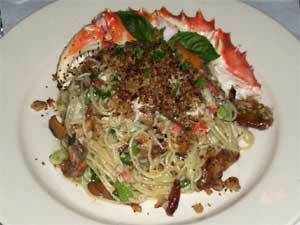 This crab had legs, and it stood up to a powerfully flavored pasta dish quite nicely. We aren't sure if your local restaurant provides this kind of service, but if you do get a call saying that the fresh Alaskan king crab legs are in, don't wait. Even at 3AM it is worth scrambling down for a taste of this king of the crabmeats. We were out at one of the local farms the other day to buy some eggs, and since this was a chicken farm, we also learned something about about the H5N1 virus. It was odd to consider something as mundane as buying eggs put as at the public health frontier right. It was almost something out of The Microbe Hunters. We've been buying chickens and eggs, actually first eggs, then chickens, from this farm for years, and all the while we've been taking certain things for granted. It turns out that chicken farmers are first responders, and our local chicken farmer was concerned enough to contact the State of Washington to ask them what they are doing about the risk of an epidemic and, more importantly, what he should be doing. Washington State does have a program to test for H5N1 in eggs and poultry, so now he is awaiting instructions for sending in egg samples as part of a program to catch any H5N1 invasion early. Unlike many government programs these days, this one has money for testing, and there are plans for controlling the virus if and when it appears. Being a first responder, he asked what to do if one of his chickens dies of a respiratory ailment, and was told that they would want some samples from the dear departed. Apparently, it isn't always obvious when a chicken has a cold, or the flu. They don't sneeze the way people or dogs do. It takes a bit of watching, we were told, to realize that chickens with head colds keep their heads pitched back, most likely because this makes it easier for them to breathe. Most of the chickens we see are in the pot, but it is nice to know that people in the State of Washington are keeping there eyes open and watching for any signs of H5N1. The first signs of West Nile virus in New York City a few years back were dead birds discovered at the Bronx Zoo. We civilians can afford to ignore a few dead birds, but with the H5N1 virus out there, it's nice to know that someone is watching out for us. It seems like only yesterday that we were wandering the high country of Olympic National Park, but the snows have been coming in and Hurricane Ridge Road has been closed early. Rumor has it that the park will be plowing, but for now we've retreated from Hurricane Hill and the Switchback Trail to one of our winter standbys, the Lake Angeles Trail which starts at 1870' above sea level, right near the entrance to the park. There was no snow in the parking lot, but about 600' apl (that's above parking lot) we started seeing a thin crusting along the trail. The traction was great, so we kept on going. The wooden bridge over the stream was covered with perhaps a quarter inch of snow, but even we managed to cross it. 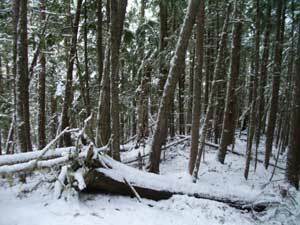 It wasn't until about 1200' apl that the trail started to seem snowy. From here on up we could definitely feel that we were walking on snow, and as we ascended, the snow got deeper. We turned around about 1600' apl, and as you can see in the picture, there was an inch or two of snow. We didn't go any farther, but there were a good number of people heading up and down the trail. They were all wearing boots, and most of them had made it all the way up to the lake. The snow there, around 2350' apl is over a foot deep, maybe a foot and a half. It sounds like rough going, but everyone we met said it had been worth it. Maybe next time.